- Perform Virtual Plastic Surgery: Using cutting-edge computer imagery, you can virtually contour your nose into the ideal size and shape. Upload a photo of yourself, take a picture using your iPhone, or use an image you’ve already saved to your album. When you’re happy with the result, you can share your before-and-after photos with your friends by email or post them to Facebook. Tooltips at every step make Virtual Plastic Surgery a fun and easy process. - Browse photo galleries: View dozens of before-and-after photos of real patients (women and men) who have received rhinoplasty from Dr. Shahidi. 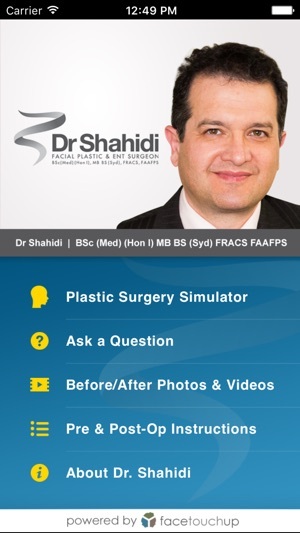 - Explore procedures: Read all about the various cosmetic surgery procedures offered at Dr. Shahidi’s Sydney practice. - Learn more about Dr. Shahidi: Right from the app, you can read the doctor’s bio, browse his credentials, and request a no-obligation consultation.